If it weren’t for the eagle-eyed firefighter and his dedication, an 11-year-old boy's life would have ended in a Wisconsin sewer on Tuesday evening. Good thing for the troubled boy, the alert and observant firefighter saw the boy’s finger pop through an opening in a manhole cover, leading to an astonishing rescue. Storms slammed the southern half of the state and southern Minnesota on that fateful day. 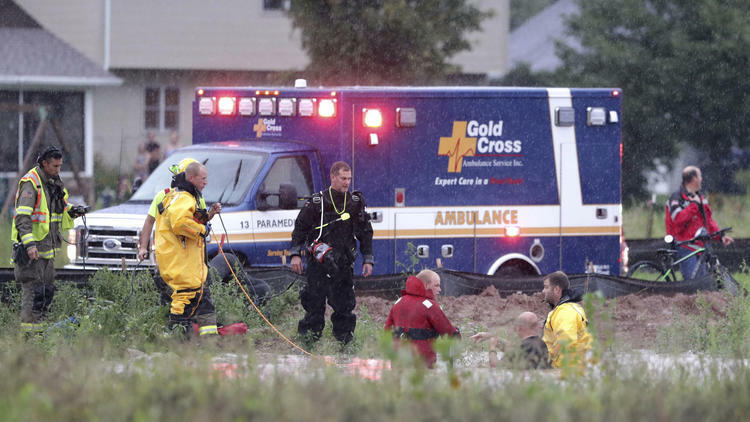 The Calumet County Sheriff’s Office shared that the boy was playing with friends in a flooded drainage ditch after the heavy rains stopped at around 6 p.m. in Harrison village. The boy later disappeared under the water and didn’t surface. It is not clear who called for help, but thankfully, a dive team, sheriff’s deputies and volunteer firefighters responded. Deputy Fire Chief Wesley Pompa said that when they arrived at the scene of the incident, they saw a bystander trying to hold onto the boy but unfortunately, he was sucked into a culvert that led to the storm sewer. Pompa said that the water was rushing so heavily and quickly it would have sucked a full-grown man into the culvert. At that time the rescuers could only wait and try to determine where the flow might take the poor boy. Pompa also asked for the reinforcement of the village road superintendent, Bon Kesler, to the scene to help map out the sewers. The boy apparently found air pocket just below the manhole cover. He was hanging onto a ladder leading up to the manhole. The firefighters managed to wrench the cover open. Pompa and Kesler then lifted the boy to safety. Authorities said that the boy was alert and conscious after the ordeal. He was brought to the hospital for basic check-ups just the same. Curiously, Pompa said he never got the boy’s name. The region has been battered by storms since last week, flooding streets and farm fields and cutting power in the process. One casualty was recorded when a man was killed in Madison as he attempted to escape from a flooded ditch last week.